vape residue off of everything in your shop? Are you concerned about breathing all that vapor all day long? Look, keeping your shop clean from the oily residue and film from the vapor is a major hassle. Plus, there’s also some of debate about whether or not it’s safe or unhealthy for you as the vape shop owner to be inhaling all that vapor and nicotine all day long. You can come to your own conclusions. I’m not here to get into that debate. If you have health concerns, great. We can help. If not, we can still help keep your shop much much cleaner than hand-wipes and paper towels. When you run a business that encourages people to vape in your shop, there will be tons of PG (Propylene Glycol) and VG (Vegetable Glycerin) in the air that will settle onto pretty much everything in your shop. Windows, glass cabinets, floors, walls, clothing, you, etc. The streaks on the windows and oily counter tops are a huge mess. For a couple of years, I’ve heard from vape shop owners who have been looking unsuccessfully for a solution to this residue hassle. They also say that there is nothing out there specifically for vape shops for the vapor mist. We’ve been solving tobacco smoke problems for the past 15 years. For this project, we partnered with our manufacturer who has 35 years experience solving air quality problems for smoking establishments. I know, I know. Vape is NOT smoke. I get that. My point is that we have decades of experience solving air quality problems. We’ve done the research about vape shop challenges and applied decades of air quality expertise and knowledge to solving vape shop problems for you. Here is what we came up with. We call it the Cloud Crusher. 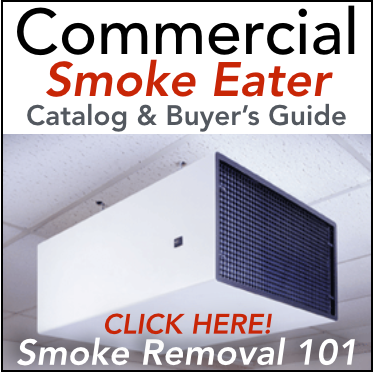 It’s a commercial grade air cleaner designed SPECIFICALLY for you! The vape shop owner. In our research and testing and initial work to solve these problems, we made quite a few mistakes. Filters: First we tested the same HEPA air filters that we use for tobacco smoke. That didn’t work well at all because those filters are made out of thin paper. The oil mist simply saturated the HEPA filters very quickly, destroying the filter, and rendering the filter useless. Mounting options: We also tried ceiling mounted air cleaners. What we learned is that anything above 8’ high didn't work very well. E-cigarette mist/vapor is fairly heavy and due to the weight, it doesn’t rise to the ceiling like tobacco smoke. Trial and error proved that a ceiling mounted system flat out didn’t perform. By using the wrong type of filter and mounting our machines too high, we definitely missed the mark. 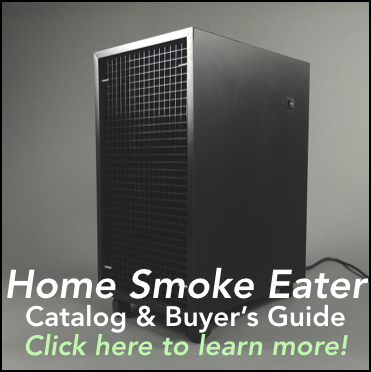 If you are considering air cleaners designed for smoke for your vape shop, buyer beware. We’ve learned our lessons the hard way and had to take back some equipment we have sent out in the past. These were costly mistakes. Having learned these difficult lessons, we built a new machine from the ground up. And that's how we came up with the Cloud Crusher - a commercial grade air cleaner designed specifically for your vape shop. Our Cloud Crusher can either be floor mounted on wheels or sat on a counter for chest-height vape removal. This floor or counter-top placement will ensure much better results compared to a ceiling mounted air cleaner. Don’t make the same mistakes we did by mounting your air cleaner too high. Don't make the mistake of buying a smoke eater and using it for your vape shop. The two are not the same. Oily clouds of vapor are much different than dry tobacco smoke. Next we had to tackle the filter problem. Knowing our disastrous results of using a HEPA filter, we went into research mode. We spoke to many filter manufacturers to find the right type of filter. Fortunately, we’ve been able to source a filter that is specifically designed for oil mist which is proving ideal for vape shops. We’ve built this new machine around this specific filter. Now, in order to protect this filter so it doesn’t fill up too quickly, we also figured out that providing 12 pre-filters (changed monthly) will provide the longest life possible for the main oil/mist/vapor filter. How long will the main filter last? That all depends on your shop. A standard vape shop can get a year out of these filters. However, if you have cloud competitions or do very high volume, you may go through the filters more often than one set of filters per year. The other thing we had to do is make sure our solution is powerful enough to get the job done. Without enough power, you won't be able to clean the air quick enough to keep up. Our commercial grade Cloud Crusher has a fan that operates at 850 CFM (cubic feet of air per minute). That means that in a 400 square foot shop, our unit will drag the entire room's worth of air through the filters every 4 minutes, or 15 times an hour. While it won’t typically pull all of the vapor out of the air immediately, it will significantly reduce the amount of vapor mist and oil that gets all over your furnishings, floors and windows. Depending on the volume of vaping going on, we anticipate you will need one of our Cloud Crushers per 400 to 600 square feet of retail space. (Don’t count your back storage, office, bathrooms, etc.) And the higher the volume of vaping, the smaller the space the machine will effectively cover. Our price for the Cloud Crusher is $1,895 delivered with free freight shipping in the continental USA to your business location. Please give us a call us with any questions. We would love to hear from you. Just dial toll free: 1-888-472-8736. Dramatically minimize the amount of residue and film in your shop, windows, countertops, floors, etc. Stop wasting time cleaning your shop. Easy, hassle free maintenance - Just a 5 minute filter change once a month. Put it where you want. Floor console or counter top placement. Portable: On wheels. Easy to move. No installation required, just plug it in and turn it on. At just 63db to 65db, conversations won't be drowned out by noise. This machine is the result of 35 years experience solving air quality problems, now applied to vape shops. Risk free. 90 day satisfaction guarantee. No restocking fees. CFM Rating: 775 CFM on Low and 850 CFM on High. 90 day satisfaction guarantee - we take all the risk. Click the button below to add the Cloud Crusher Vape Shop Air Cleaner to your wish list.